Kevin Ross has fought in high profile events during his tenure at Sitsongpeenong’s camp in Bangkok. Ross just came off a recent tour of duty at this year’s Toyota Cup 8-man tournament. Ross would give by all accounts a very good account of himself against Massoud. Ross would eventually lose by decision in the semi-final of the 8-man tournament but in general impressed all who witnessed him in the ring. 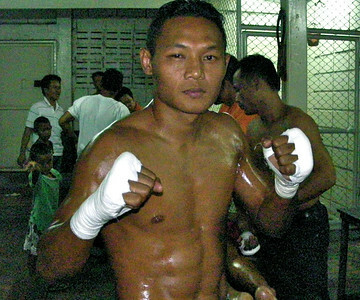 Saenchai Sor Kingstar, widely regarded as the best pound for pound Thaiboxer in the world, would win all fights by finishing with a TKO or KO. But Kevin Ross’ reputation in Bangkok increased for the excellence he demonstrated in the ring. It’ll be interesting to see if this match coalesces into a reality we can all eventually witness. This would almost singularly become the highest profile fight an American nak muay has ever undertaken should the fight actually happen. Kevin Ross is scheduled to participate in the Thai Fight tournament which will be broadcast with an accompanying reality TV program on Thai television. I heard KR did great at this tournament. Well done to him for fighting at this level. I have a hard time believing Saenchai said this though — it seems uncharacteristic of him to say the least. Anyway great site — thanks Mike for your efforts. No problem thanks for coming by. i’d like to see ross go up against some of the UK guys – harrison especially! Could be next! I have to assume Kevin’s time in Thailand served to raise his profile quite a bit internationally.